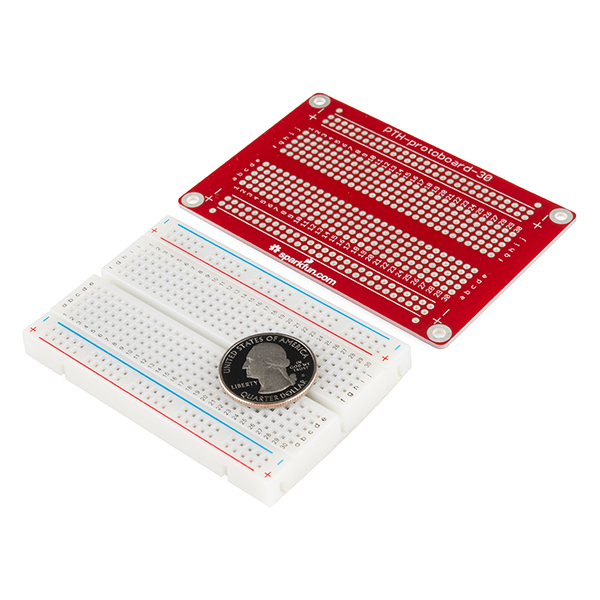 This is the SparkFun Solderable Breadboard. A bare PCB that is the exact size as our regular breadboard with the same connections to pins and power rails. This board is especially useful for preserving a prototype or experiment you just created on a solderless breadboard by soldering all the pieces in place. Doing some digging for the solderable breadboard, it looks like the width size is about 0.032" in the Eagle Files. Looking at purchase order for the PCBs, we usually order a standard FR-4 PCB so the copper trace thickness should be 1oz/ft^2. Using an online calculator [ https://www.eeweb.com/toolbox/external-pcb-trace-max-current ] this looks like the breadboard should be able to handle maybe about 2 amps. We have not stress tested the PCB so I am not sure how well it can handle that amperage. I recommend using the prototyping board at a lower current than what was calculated. I built a mounting clip for this. One screw allows you to mount it wherever. Buy the clip on Shapeways! I bought a handful of these and was slightly bummed to find that they are not QUITE the same geometry as a standard breadboard. The handy dandy BB power supplies from China (various brands) that offer 3v3 and 5v and span the breadboard, using both power rails, plug easily into any breadboard but do not quite plug into these sparkfun red boards. The spacing of the power rails apart is off by maybe 1/32" (too far apart). Argh! My plan is to modify the Eagle file and have some fabbed for my own use, but it would be nice if SF fixed this because those mini power supplies are quite handy. What is the pitch of the power rails? Will a PRT-08432 screw terminal properly fit? add plastic boxes with mounting holes so I can screw the breadboard into a box and have a semi-finished project! Make them in standard card sizes so people can buy extruded aluminum boxes that have slots they can actually fit in. There is some kinds of Euro standard floating around for PCB card dimensions that most slotted box manufacturers are sticking to. I would like to run 0.82amps at 13V through this board. Does anyone know how much current this board can handle? Glue everything in place, There's no such thing as overkill. I like the idea, but I'd like to see other sizes as well. I have a circuit on a "mini" breadboard that has problems with things "shaking loose" and this could solve that problem, but there's not enough room for this size (and before someone jumps on me, I'm too lazy to cut the board). One important question: are the rows that are connected on a breadboard connected on this? In other words, if I power a hole in row for, would the rest of row for on that side of the middle be powered? with the same connections to pins and power rails. can you cut the pads so i can do side by side pwm headers on this board? Has anyone found a project enclosure that works well with this? These ones sold at Circuit Specialists (https://www.circuitspecialists.com/extruded-aluminum-enclosure-2506h-43.html) say they are designed for 2.5" cards, which is the width of these breadboards. The length though will leave a little play of maybe a half inch. Maybe not a bad thing though if you are looking to mount any type of pot or switch on the front panel. For those wondering, the mounting holes are set 3.4" x 2.2"
Are the holes on each row of five, and down each power rail, connected as a breadboard is? Or do I need to solder jumpers across everything I want to connect? Yep, that's the beauty of these little guys. They have the same electrical configuration as a breadboard. I would like to see various sizes of FR-4 pad per hole, double sided with feed through. Cutting the board along the middle rail (hotdog style) wouldn't render it functionless, hopefully? Received a couple of boards - I do like them. Would like to see a longer board of this type. The one complaint - the holes on the outer power strips are not aligned with the inner holes. A bank of resistors for pulling lines high or low have to be angled. Many times I use a DIP switch bank and will not work on this board. The hole pattern is actually copied directly from the small solderless boards - the holes on the power rails are indeed halfway between the interior holes. I was as surprised as you are about that. I will see what can be done about a larger board. The power rails on the larger solderless boards do line up with the interior grid. Well, I'll think I'll cross this off of my wish lists then. While I agree a lot of breadboards do not have the power rails lining up with the data pins, there are a few that do for at least a few pins. I find having at least a few pins line up for using DIP switches is useful. In terms of perf boards, the Adafruit perma-proto quarter/half/full/mint-tin sized boards have all of the power rail pins separated by multiples of 0.1" spacing so that you could easily use larger DIP switch banks or other things. It would be nice if the Adafruit boards didn't have the gap between the power rails and the data pins, so that you could solder in 3 hole male/female headers to plug in servos or sensors with the normal 0.1" spacing. Similarly, the BusBoard Prototype Systems SB400 have one rail that is next to the data pins (unfortunately, the other two sets of power rails on each side are not a multiple of 0.1", but at least for the ground rail, you could use DIP switches). For larger boards, the BusBoard Prototype Systems BR1 does have all of the power rails multiple of 0.1" inches (and the BR1 has 3 power rails, to allow for using external power or mixed voltage systems). 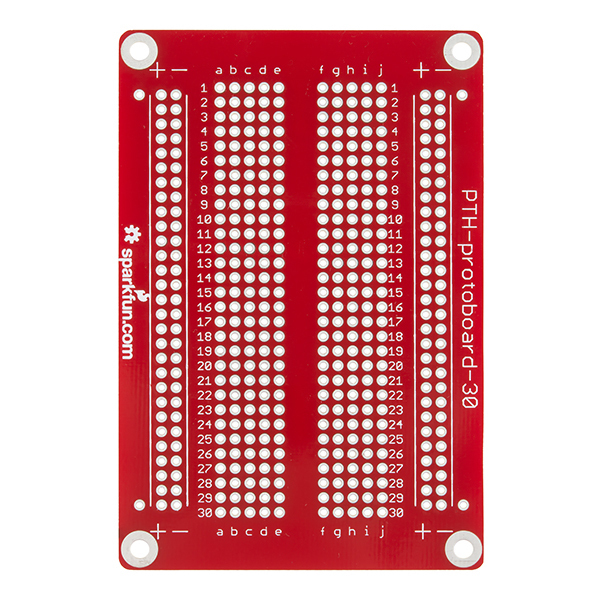 It would be nice if this had the middle two columns of holes added (the ones that are in the space between the left and right half of the breadboard). I often need adapters from double-row header pins (for connecting to IDC cables) to breadboard spacing. I understand why they don't put it on plastic breadboards, but I don't see a reason why it would be detrimental on one like this. A line of silkscreen down the middle should be enough to visually indicate where the middle is. Two questions: 1. 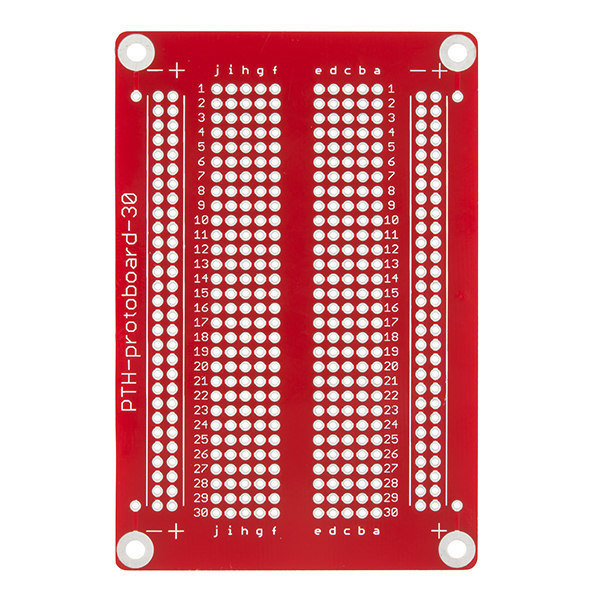 Will this board reliably hold the components on its own, like a normal breadboard would do, or are the holes too big for that? 2. Are the holes plated through, or only on the surface? 1). No it won't. this PCB is designed to look like a small breadboard. Except more permanent. For when you made that perfect prototype on a breadboard and want to make it a permanent. 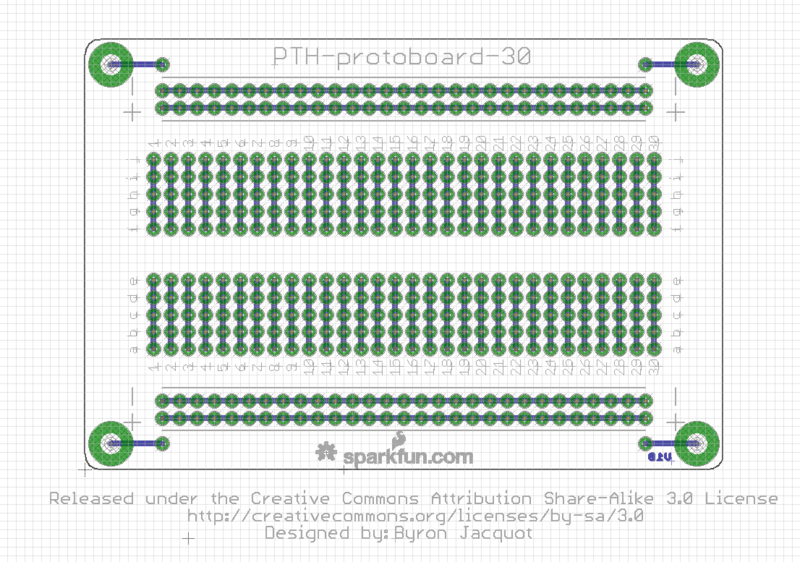 2) Considering the PCB design im pretty sure every hole is fully conductive from side to side. rare to see production boards like these that arent. Can you put this on top of your breadboard and still use the breadboard? It would be nice if you could just lift the PCB off the breadboard when your circuit works, but the board might be too thick for the components to make good connections with the breadboard? The fit of this board over a breadboard depends on the breadboard. They're not all created equal, and they aren't made to the tightest of mechanical tolerances. 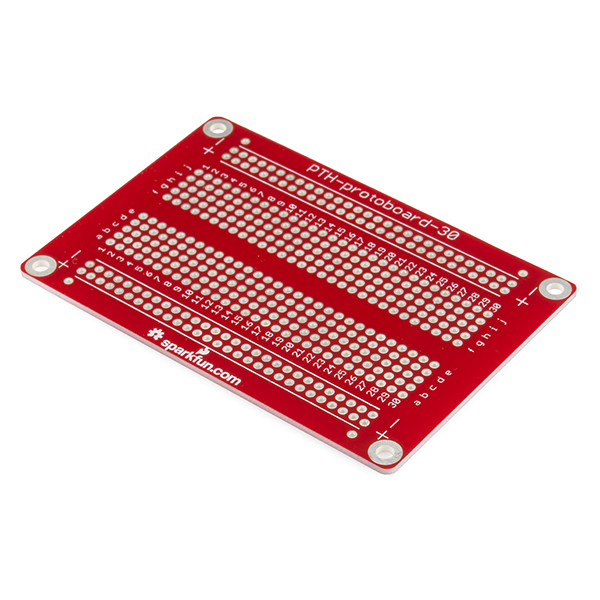 This board fits our 30 row (half size) breadboards, such as PRT-09567 or PRT-12002. The holes on the power rails on those boards are .050" off from alignment with the holes on the center grid, which is matched by this board. The full size boards (like PRT-00112) have the rail holes aligned with the center grid, so this board isn't a fit. It would be nice if there was a thin version of this that would reliably work with DIP ICs... If that's even possible. Are there solder pads on both sides of this board? Yes, the holes are standard plated-through-holes. Copper on both sides of the board, as well as inside the holes. I think it would be great to just sell the PCB board. Once you have some breadboards you might not need another. It is just for the PCB, there was an error in the description. It's pretty simple, really, it's just a breadboard. However, it's pretty much the best breadboard it can be. The through-holes heat nicely for really easy soldering, it feels really sturdy, and it looks nice. It's a little weighty, so maybe not the best in flying/other weight sensitive projects, but overall, I have no complaints. Good work! Great boards for prototyping. The hole sizes accept to-220 devices. I just wish it were cheaper! I had fun putting together the Arduino DMM digital multimeter instructable an analog circuit on these boards. I adapted the analog to connect in C programming to a C8051F320/1 breakout pcb. I didn't want to order the PCB as to add MTA connectors. Finally got around to making my project more permanent. It was great to have the breadboard layout for easy transition. With its match of layout and number of connection points, this board makes the transition from prototyping boards to usable circuits a snap. The holes in the ' + ' and ' - ' busses do not align with the main field of holes. They align with the spaces in between the holes instead. On regular breadboards they are slightly off due to tolerances of connecting the 2 pieces (main board and slender buss boards), but alignment is attempted. I would hope this to be corrected if a newer model is introduced. Good suggestion. We'll take this into consideration in the future. Sorry this didn't fit the way you expected. These are good quality boards. I would buy them again for sure. Where has this board been all my life? My protoboard soldering skills are terrible, My boards always turned out looking like I'd poured solder over a pile of paperclips, That's why I absolutely love this protoboard! It's easy to transfer my breadboarded circuit over to the protoboard, solder it up, and never have to solder two wires together. Extremely easy to solder on. Has same underlying connections as a breadboard. Using Breadboard friendly components and other breakout boards by Sparkfun with headers attached, you are able to stack pretty easily with this one with space for components and interconnect on both sides. Its pretty awesome and a great way to organize a simple circuit for future upgrading as it wont require much of a schematic to refer back to. One glance tells you where power is coming from and where you can tap into to add more to the device. I build alot of projects on this type of board. I like this one especially because it has plated thru holes and has both + and - power busses on both sides of the board. Perfect for soldering production builds. This board was perfect for soldering an LCD screen and other components for my project. The through holes are a good quality. I used other boards for my prototypes and the heat required for soldering always melted away the surface traces if I didn't get it exactly right the first time. With this board that has never been a problem soldering and desoldering is a breeze. I admit this is my first proto board, but it worked great. Love how the color matches my red board arduino.